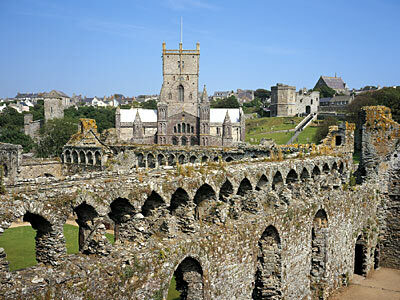 During the Middle Ages there were few landowners in Wales wealthier than the Bishop's of St Davids. As well as being princes of the church, they were Marcher Lords in their own right, owing allegiance only to the king. It is hardly surprising, therefore, that at their cathedral city these powerful prelates created a group of medieval buildings unsurpassed anywhere west of Offa's Dyke. Even in ruin, the palace is a magnificent architectural splendor, speaking volumes of men rich in experience of both Church and State. The entire cathedral close was surrounded by a precinct wall and one of four gates. Porth y Twr, which dates to about 1300 remains standing. Within, the palace is very largely the work of a succession of 'builder-bishops' who held the see in the later 13th and 14th centuries. Edward I and his queen were at St Davids on a pilgrimage in 1284, and their visit may have well called attention to the inadequacies of the early medieval palace. About this time, bishop Thomas Bek (1280-93) began a program of new building commensurate with his role as a major churchman and former statesman of King Edward. He was responsible for the chapel in the south-west corner, the hall and the private apartments, and the gate. The bishop's hall and the private chamber were on the first floor, and were carried on a series of barrel vaults. Notice the superb series of corbels carved as human heads which span the main trusses of the roofs in this range. But the man who more than any other left his imprint decisively and characteristically on this palace was Bishop Henry de Gower (1328-47). In addition to major works in the cathedral itself, including the imposing rood screen, it was de Gower who built the Great Hall, which remains undoubtedly the finest range. Moreover, he brought a graceful unity to the palace with the distinctive arcaded parapet which takes command of the beholder's eye. It is similar to the bishop's other work at Lamphey, and probably Swansea. The hall is again on the first floor and was designed for the entertainment of important guests. The wheel window in the east gable is a sheer delight, and the majestic porch would have provided a fitting entrance to so fine a building. Notice, too, the chequered pattern in the stonework on the upper stages, which may have been very striking in its original colors. Later bishops made further additions and alterations to the palace, but with the Reformation the story of decay and destruction in the 16th and 17th centuries begins. A new exhibition, entitled Lords of the Land, is situated in parts of the palace undercroft. It tells more of the wealth and power of the medieval bishops, and explains the phases in the growth of the buildings.